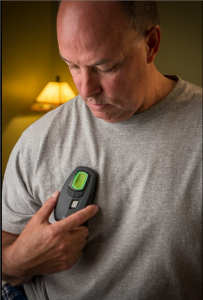 Inspire Therapy (Upper Airway Stimulation) is a novel, FDA-approved treatment for people with obstructive sleep apnea (OSA) who are unable to use or get consistent benefit from continuous positive airway pressure (CPAP). Inspire therapy is an implantable device that delivers mild stimulation to key throat muscles, keeping the airway open during sleep. The device is controlled by a small handheld remote, allowing you to turn Inspire therapy on before bed and off when you wake up, increase and decrease stimulation strength, and pause during the night if needed. Inspire therapy is implanted during a short surgical procedure, typically in an outpatient setting. Sleep Insights was the first sleep medicine practice in Central and Western New York to offer Inspire therapy. Is Inspire Therapy right for me? You will first need to see a Sleep Insights sleep specialist to determine if you are an Inspire therapy candidate and to learn more about this treatment option. To learn more about Inspire therapy or schedule an appointment, call (585) 385.6070, the location nearest you or contact us. You can also visit www.inspiresleep.com for additional information.